Juneau Bear Viewing Tour to Admiralty Island, Guided Pack Creek Bear Viewing in Alaska. Admiralty Island, also known as the "Fortress of the Bears" is the location for some of the finest brown bear viewing in Southeast Alaska and Juneau is the perfect basecamp from which to launch your adventure of a lifetime. 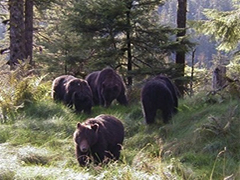 Admiralty Island is home to one of the world's highest density of brown bears. Approximately one million acres or 1,600 square miles of wilderness provides a home to approximately 1600 bears. Our packages include fly-outs and guided bear viewing. Combine your tour with wilderness canoeing, superb fishing and hiking opportunities. Leaving daily from Juneau, we take you to check out some of Alaska’s amazing brown bears in their natural habitat. You’ll fly to either Admiralty Island or Chichagof Island, where the brown bear densities are extremely high. Each island is home to 1,600 brown bears—more bears than you’ll find in all the Lower 48 combined. And the trip is easy, with the shortest flight to see brown bears in all of Alaska. This is immersion in bear territory: There’s no lodge or development out here, which means you won’t be fighting crowds to see these magnificent creatures. Depending on when you go, you’ll see bears and their mating displays, foraging for clams, or fishing for salmon. You might get up close to mothers teaching cubs how to catch salmon, spot sleeping bruins in grassy day beds, and wander trails stamped out by bears. Your guide will meet you for an orientation and outfit you with rubber boots and gear you'll need for a day in the wilderness before the 25 - 30 minute floatplane rid. Fly over turquoise coves and inlets fringed with green islands as you look for whales, eagles, and (of course) bears. You’ll land in a small ocean cove on Admiralty Island, within the Stan Price State Wildlife Sanctuary, a protected place for brown bears. A short quarter-mile along a rocky beach takes you to a small bluff overlooking a meadow where you can observe bears fishing in the creek or foraging along the shoreline. There is also the possibility of a one-mile hike through towering, 500-year old spruce forest to an observation tower, where you may see spawning salmon and bears. This option has you in bear habitat for about 5-6 hours.